Word clouds are a great creative tool that many of us love to play around with. They generate an image composed of words from content that has been submitted in the tool. The size of individual words in the word cloud indicates its frequency or importance. 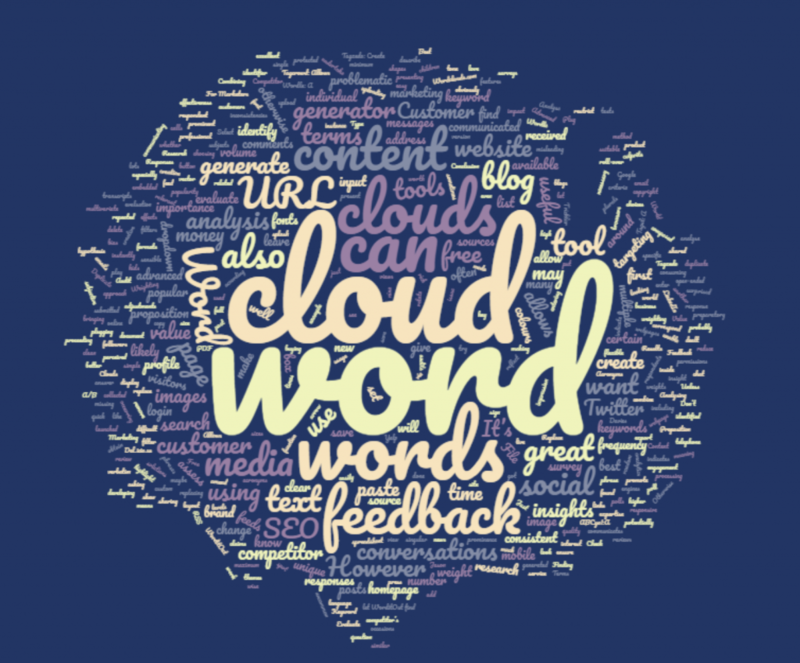 However, word clouds are also very useful tools for conversion rate optimisation, content creation, brand evaluation, competitor analysis, SEO keyword targeting and analysis of qualitative research. Finding images that are suitable for your blog or social media posts can be time consuming and problematic as many images are protected by copyright and have permissions which restrict usage. However, we know from research that blog posts with images have much higher engagement levels and are more likely to be shared. So, to save time and money copy and paste your new blog post into a word cloud to create a free and unique image for your new content. 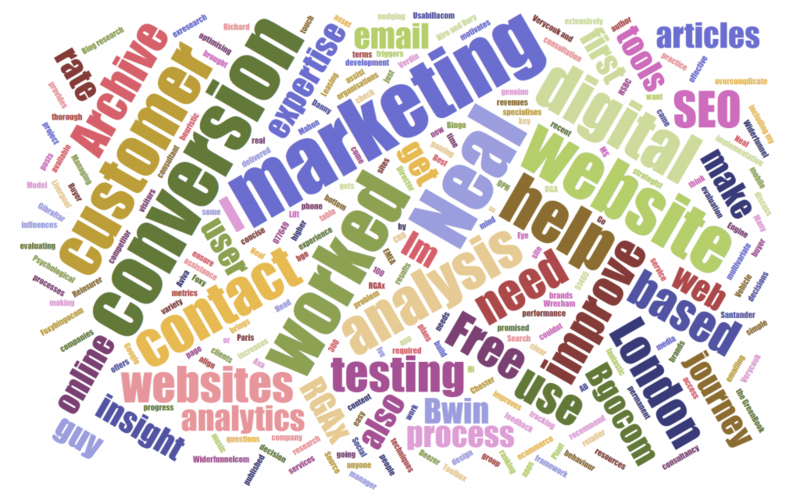 Word clouds are also useful to evaluate how well your value proposition messages are embedded in your content. Check how well your brand messages are being communicated by plugging in your website address or social media URL. World cloud tools like Tagxedo allow you to input your Twitter and social media feeds. This can highlight the value of the content you are sharing and allow you to identify the themes that are occurring most often. Do these correspond with how you want to be perceived by your social media followers? Analyse your LinkedIn profile in a word cloud generator to ensure your profile communicates a professional tone and is using the best words to promote your expertise. If you have a Yelp page, use a word cloud to assess how your customers describe your service. Word clouds are a great SEO tool as they instantly indicate which words are most prominent in your marketing content and how Google or other search engines are likely to assess your content. 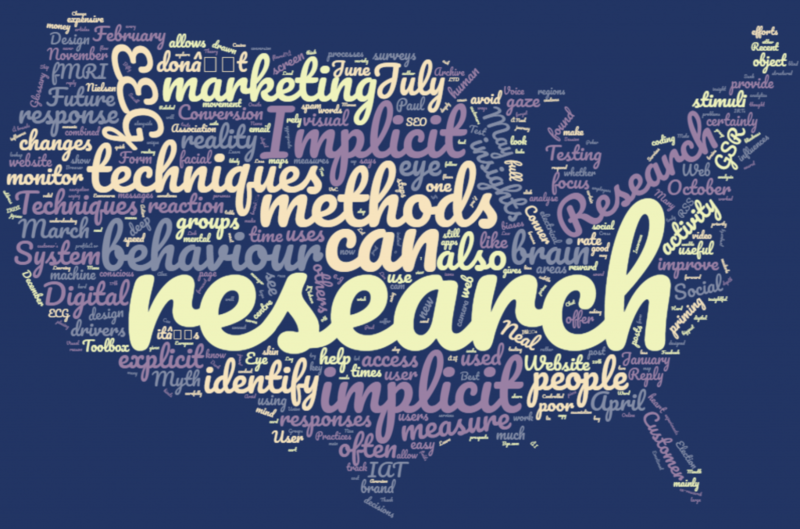 Just as you can evaluate your own marketing content and keywords using a word cloud, you can also use the same approach to undertake some competitor research. Plug in your competitor’s URL into a word cloud to identify the keywords they are targeting and how consistent their value proposition is communicated. Customer feedback is not just collected through online polls and surveys. Customer conversations are also a great source of feedback, whether via telephone calls, live chat, emails or product ratings and reviews. You will probably be surprised at the number of sources potentially available to you and the volume of feedback. Don’t let the volume of feedback put you off as word clouds are an excellent means for processing verbatim customer conversations to obtain quick and clear insights. Such conversations can be a great source of insights for developing hypothesis for A/B tests. However, before proceeding with using a word cloud to analyse customer conversations it is wise to do some preparatory work to clean up your transcripts or survey responses. Otherwise you may find that duplicate feedback or similar meaning terms reduce the effectiveness of your word cloud at communicating key insights. It’s not uncommon for some visitors to answer a survey or leave feedback multiple times. Unless this is dealt with a single customer can skew your analysis, especially if they have repeated the same comments on multiple occasions. This is often easy to spot if the respondent has to leave an email address or another unique identifier. Once you have identified the culprits go through and review their feedback and delete all but the first response. It’s better to be consistent with your method as otherwise you will be bringing in subjective bias into the analysis. I once launched a poll on a homepage on a mobile responsive website by asking the open-ended question; “What is missing on this page?” We received lots of comments from mobile visitors about being unable to login, sign in or see the login box. All of these responses obviously related to the same issue and so it was sensible to combine the terms. This can easily be done by using the “Replace” function in a spreadsheet. It’s also worth looking out for plurals and replacing such terms with the singular version of the word. Acronyms can also be problematic if some respondents use the full phrase and so search for such inconsistencies to replace acronyms where necessary. When presenting word clouds you sometimes want to give more weight to certain terms because of what you know about their impact on your business. For instance you may want to give more prominence to feedback on your most popular webpages or blogs in your word cloud. Word cloud tool Wordle allows you to change the weighting of certain words by making adjustments in the advanced mode. For example you could weight words according page views to reflect the popularity of a page or blog they relate to. However, make sure you make this clear when you present your word cloud as otherwise this can create a misleading impression of the feedback received. Word clouds are flexible and free tools that can save you time and money. Before you splash out money on buying competitor analysis, SEO keyword audits or text analytics tools try out word clouds first. Below are nine of the best free word cloud solutions available. My recommended word cloud is Wordclouds.com as this is an easy to use but flexible tool with some great advanced settings. Visually it also looks superior to most other tools. ABCya! :A word cloud for kids that may be relevant if your website is of interest to children. Type or paste text into the box below and press the arrow button to view the word cloud generated. Jason Davies: A great tool if you want to generate a word cloud from a blog or website. Tagcrowd: Allows you to set specific criteria for your cloud such as language, maximum number of words and minimum frequency. Allows you to create a word cloud from a webpage URL, Twitter ID and other social media feeds. Tagxedo: Create word clouds from a URL, Twitter ID, Del.icio.us ID, news, search, RSS feed, uploading text or enter it yourself. WordArt (Formerly Tagul): A word cloud generator with advanced features including words inside words, rich font choices, roll-over effects, custom shapes, colours and fonts and export in vector formats. Tricklar: This site claims to use high quality media sources from around the world to generate word clouds. I found it difficult to find words or phrases that it would generate a word cloud for and so maybe only useful for popular subjects. Wordclouds.com: This is a free word cloud generator which can be used with most browsers. On the homepage got o “File” and upload a document or PDF, paste text (by File dropdown), input a URL or amend the word list (dropdown). In the word list you can even add links to individual words by entering the URL after the word. WorditOut: Advanced filters allows you to filter the text to display or remove words and change their importance. Select your own layout by choosing your own colours, fonts, and sizes or let WorditOut find a random look for you. Wordle: A simple word cloud generator which allows you to set the weights of words. Thank you for reading my post and I hope you found it useful. Please share using the social media icons below if you like this post. Neal has had articles published on website optimisation on CXL and Usabilla.com. As an ex-market research and insight manager he also had posts published on the GreenBook Blog research website. If you wish to contact us please send an email to info@conversion-uplift.co.uk. You can follow us on Twitter @conversionupl, see Neal’s LinkedIn profile or connect on Facebook. Why Is A Silo Mentality Killing Your Growth Strategy?